In a world where 69% of us photograph our food before we eat it, Instagram is the place for restaurants, cafes and street food vendors to grow their brand and attract customers. Instagram has become more valuable to restaurant marketing than most websites, with people discovering new places to eat on the app, and deciding whether they want to go there based on the restaurant’s Instagram feed. 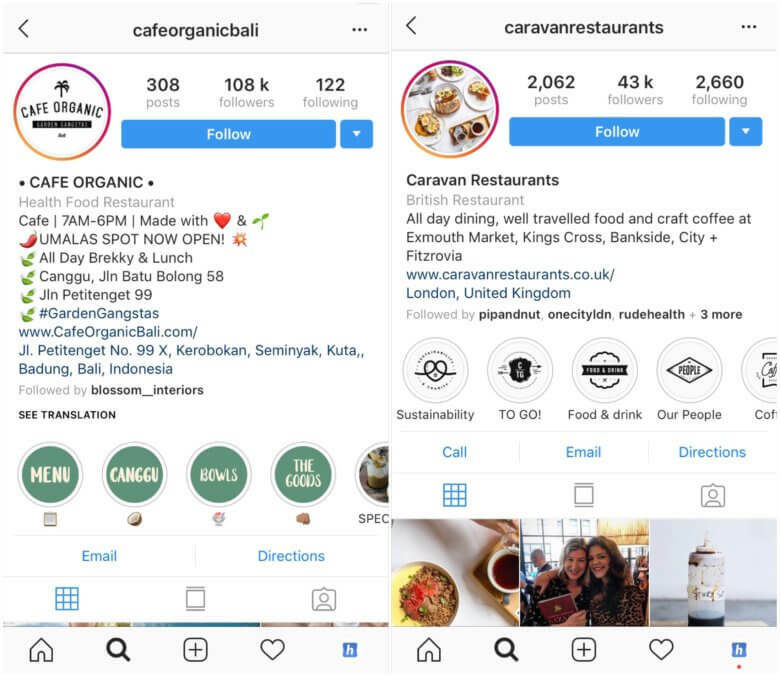 “Instagram goes hand-in-hand with word-of-mouth” says Maree Suteja, owner of Crate Cafe, Bali, which was designed with Instagram in mind. And the demand is there! It doesn’t take much googling to find lists and lists of the ‘most Instagrammable restaurants’ in a city. 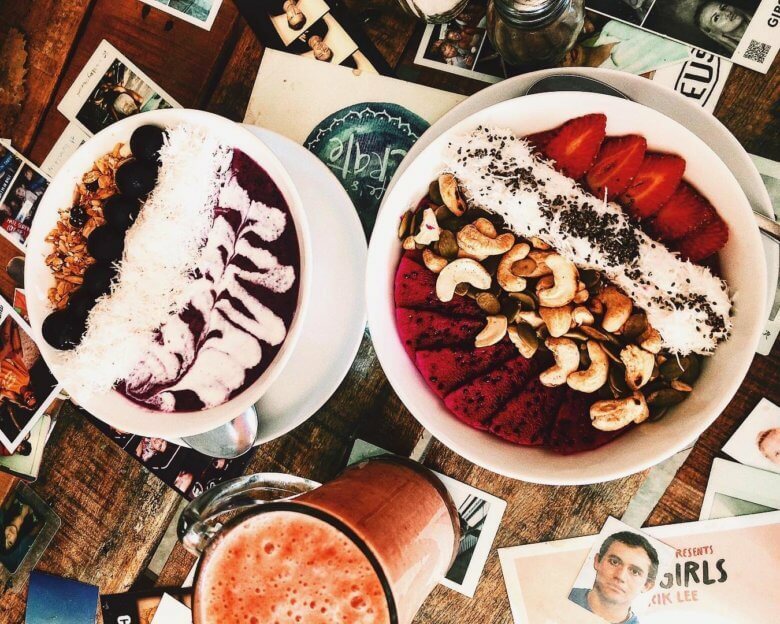 The users who are looking for these places to post on Instagram naturally become brand ambassadors for the restaurants — it’s complete genius, and the magic of Instagram for restaurant marketing. Keep a hashtag in your bio which tells customers what to tag when they post Instagram photos at your restaurant! This will help you keep track of user-generated content. Another reason for encouraging and posting UGC is that it saves you time that would’ve been spent creating content, which you can spend focusing on other areas of your restaurant marketing! Including a hashtag in your restaurant Instagram bio encourages users to tag you in their posts, and gives you a way to keep track of UGC. For more information on Instagram hashtags and how to use them in your restaurant marketing, check out our all in one guide! A great restaurant marketing strategy is to plan campaigns around social media holidays! 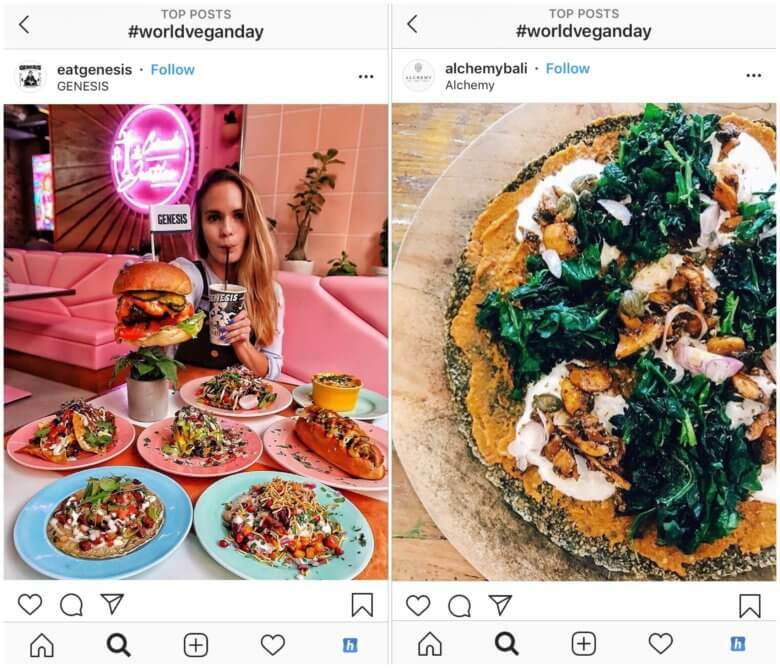 There are lots of commemorative food and drink days that garner a lot of attention on Instagram and Twitter alike, think #NationalProseccoDay and #WorldVeganDay. Creating content for these events increases your reach (because the hashtags will be trending) and is great if you’re running low on ideas (because you can plan in advance). There is so much potential for creativity when creating campaigns around food social media holidays. Depending how far in advance you plan and schedule Instagram content, you can create content especially to post on the day, or even create a (particularly Instagrammable) dish especially. Similarly, on the day itself, you can use the hashtag to promote a special offer or menu item. Restaurants using #WorldVeganDay to promote their vegan menu items. Restaurants don’t need to limit themselves to food and drink social media holidays! There are plenty of commemorative days and events that you can tie into your restaurant marketing campaigns, such as #NationalFriendshipDay. Maybe it’s the colour of your walls, or the surface of your tables, or a range of bright dishes — whatever you choose as your main content focus, try and stick to a consistent colour palette. Restaurant marketing on Instagram is entirely visual, and a cohesive feed could be the make or break of someone scrolling on or clicking the follow button. 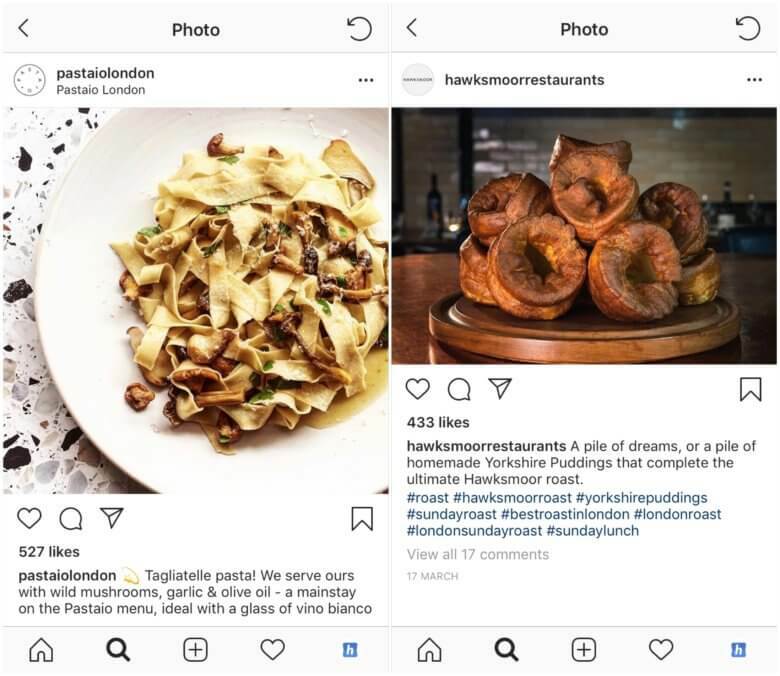 Random and inconsistent looking content will make your restaurant’s Instagram page look messy and generally less aesthetically pleasing. 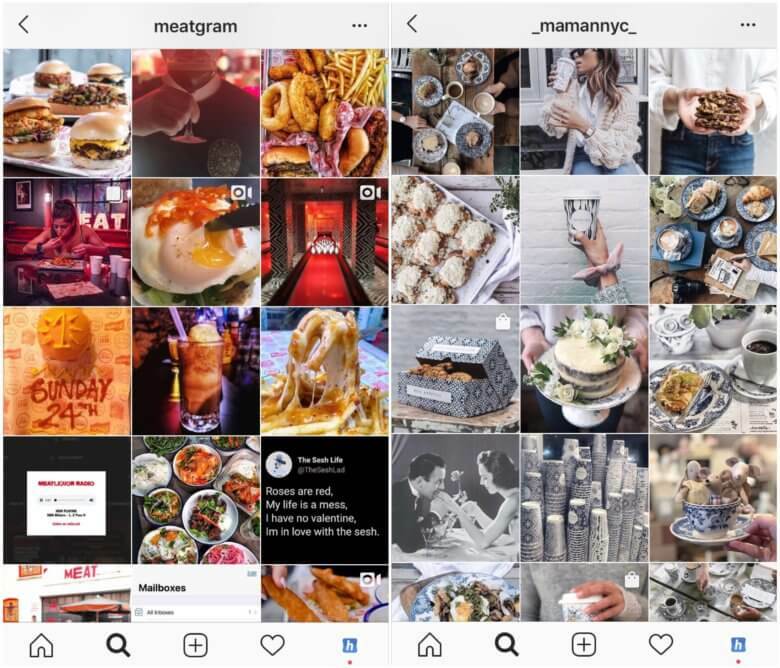 The important thing with restaurant marketing on Instagram is to try to post with your whole feed in mind rather than individual posts, as it will help you create a stand-out profile. Compare the two restaurant feeds below: the first posts a random collection of content without a clear colour palette or theme in mind, the second maintains a pale white and blue theme which creates a much more satisfying effect for profile visitors. 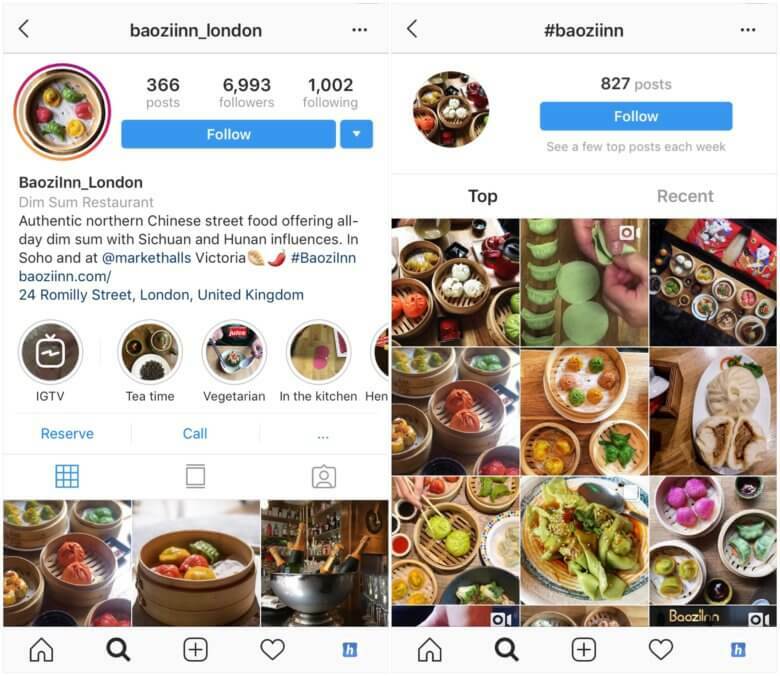 A restaurant Instagram feed without a consistent style of content, vs one with a colour palette. Naturally, sticking to a colour palette on your restaurant Instagram feed requires more discipline and planning than posting as and when you feel like it. This is when you need to use an Instagram Grid Planner like we have at Hopper HQ. You can upload your content from your desktop, schedule it to Instagram in advance, and drag and drop the posts to create the perfect theme. Using a grid planner like this for your restaurant marketing on Instagram saves loads of time, and prevents any posts clashing or looking too repetitive. Another must for restaurant marketing on Instagram is Story highlights! When somebody lands on your profile, you want to give them as much as possible to look at and learn about your restaurant before they go elsewhere. Story highlights essentially act as a menu on your Instagram profile, that users can navigate much like a website. Whether it’s your menu broken into categories, weekly specials, meet the team profiles, or your favourite customer photos — think about what you want to convey about your restaurant at the top of your profile to make visitors want to follow you! Examples of Story highlights that tell visitors more about the restaurant. As these restaurants have done, we’d also recommend making Story highlight covers as well. This will make your Instagram profile look clean and professional, and is generally more enticing to click! You can make these covers through Stories themselves, or on a third-party graphic design app such as Canva. Instagram is all about virality. If you have something associated with your restaurant this is highly photographable and unique, it has the potential to become an Instagram craze. As far as restaurant marketing goes, this is a winning strategy. 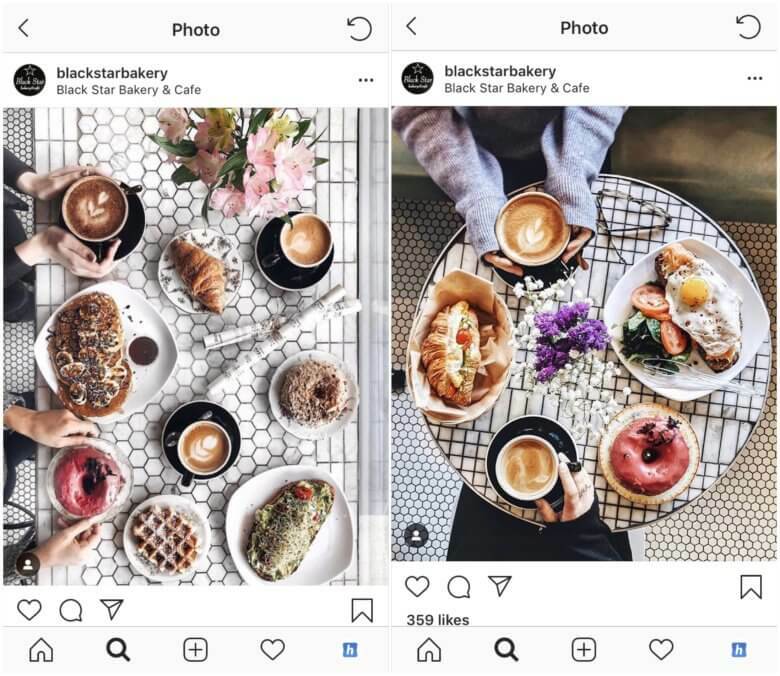 Not only do your customers become brand ambassadors when they share photos of this ‘cool Instagrammable thing’, people will come to your restaurant because they have seen it on Instagram. 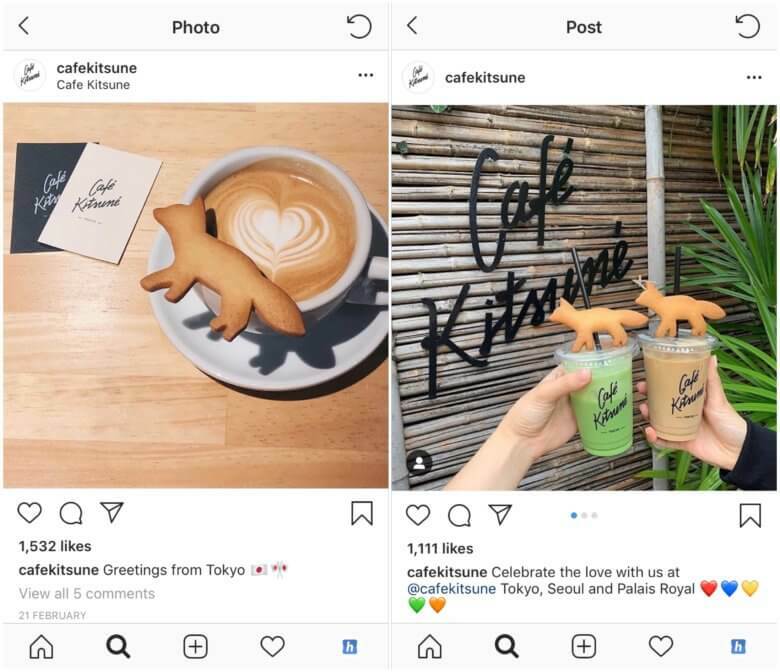 These foxy biscuits have become an Instagram trend in Tokyo associated with this cafe. It’s a beautifully simple but hugely successful restaurant marketing idea. This can be applied to any restaurant or cafe, and has great potential for creativity depending how big (neon sign on the wall) or small (unique coffee art) you want to go! Food is such a popular industry on Instagram (I mean we all need to eat right?) that there are thousands of influencers and bloggers in the space sharing restaurant recommendations, recipes, and amazing content. These users typically have very engaged audiences in the areas they are based, which is why partnering with them is a great way restaurant marketing tactic for reaching new potential customers! There are so many ways to collaborate with influencers depending on your budget and objective. Many food bloggers with a large following will charge per post or Story, whereas some micro influencers may give your restaurant a shout out in return for their meal on the house. 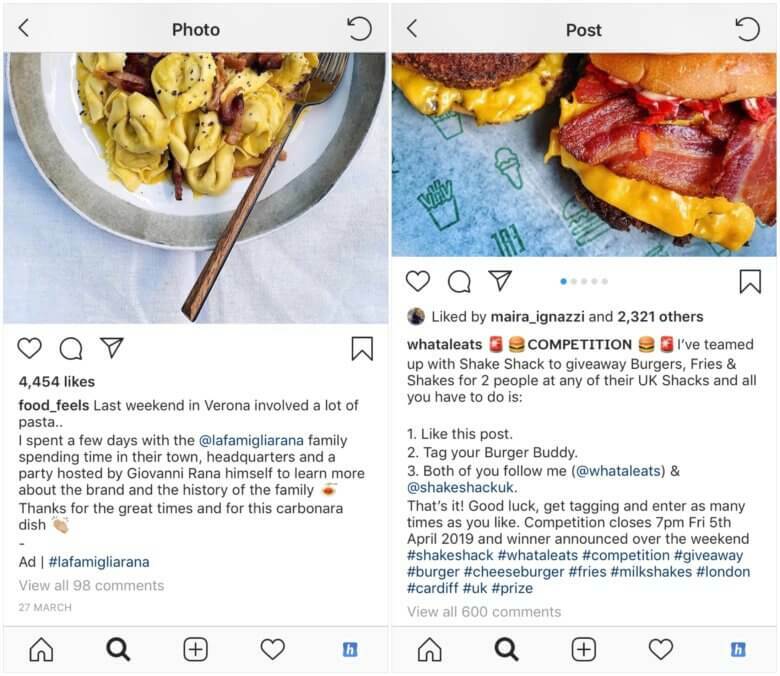 Here are two examples of food influencers posting about restaurants: one is clearly labelled as an ad and the other is a partnership competition (more on Instagram competitions in a moment). Partner with food bloggers on Instagram to increase your reach. For more information on working with influencers, Do’s and Don’ts of influencer marketing, and tips for getting the most out of campaigns, check out our guide! 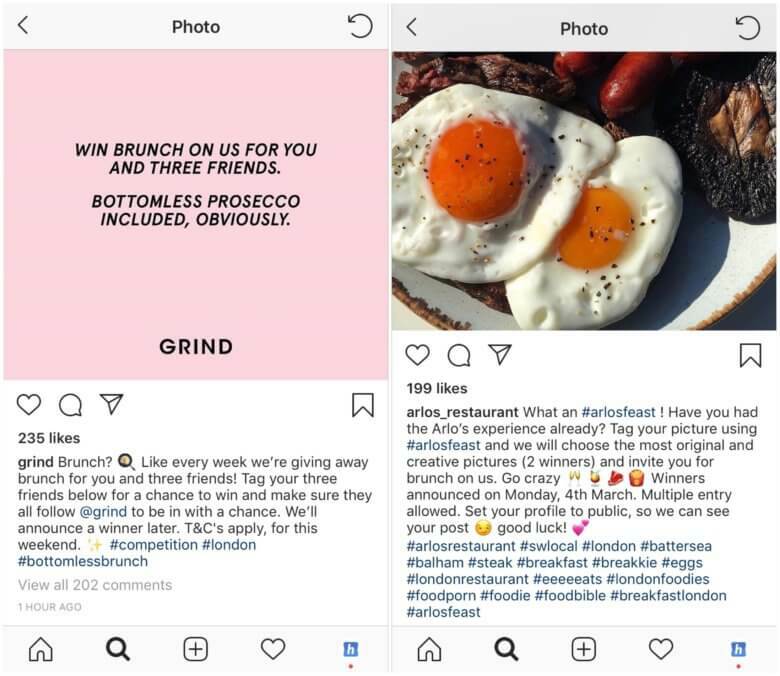 A valuable restaurant marketing tactic for Instagram is to run competitions with your audience. This not only increases engagement — with your followers liking and commenting to enter — but also your reach — by making ‘tag a friend’ a requirement for entry. Your followers therefore help increase brand awareness for you by tagging people (who will likely also live in your area) in your competition post! Tag a friend or snap a photo — different ways of running an Instagram competition for your restaurant. For a more detailed guide on how to run an Instagram competition, check out our 5 step guide. 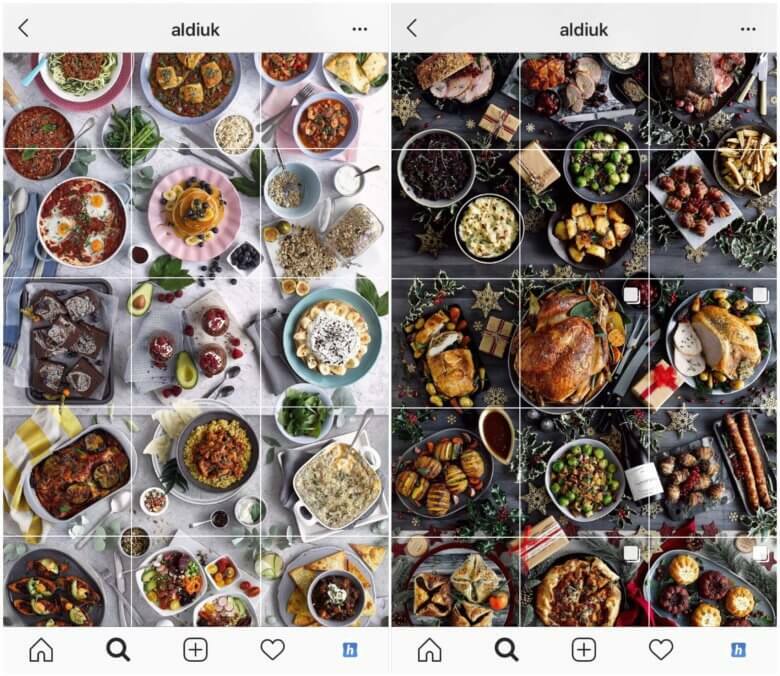 A restaurant marketing trend across Instagram is utilising flat lay photography! Both restaurants and food bloggers alike photograph their tables from a bird’s eye view to create the satisfying effect we’ve come so used to seeing on Instagram. Yes, it may be slightly embarrassing standing on a chair to nail the shot, but it’s what you’ve got to do if you want your Instagram profile to stand out (or hopefully your customers will do most of it for you — check back to point #1). This is another reason to have statement furniture or ornaments to make your tables really pop on Instagram! Think photo-first: whether it’s flowers, napkins with eye-catching patterns or any pretty embellishments — anything that makes it irresistibly photogenic will make a difference. This cafe is nailing flat lay table shots. As good as iPhone cameras are, it’s worth investing in a high quality DSLR if you really want to take your restaurant marketing to the next level. Good lighting is important to restaurant marketing for both you and your food photography, and the shots that your customers will take and share on Instagram! Natural lighting lends itself well to Instagram, particularly for those accounts aiming for a pale theme or feed colour palette. However, even if your restaurant (and therefore Instagram feed) is dark, you should always try to photograph your food in well lit settings. Examples of food photography in both natural and artificial lighting. If you’re promoting new dishes or seasonal specials on Instagram, take the photos on a table with the best natural lighting, or even outside. Avoid photographing food in completely direct sunlight though, as it can over expose the shot and also give cause harsh shadows. The most important thing is to stay consistent with your restaurant marketing, brand, and Instagram theme! Finally, both the angle and lighting of your photography should emphasise the food at the forefront of the photo. This is supported by the composition of the shot itself. Particularly for flat lay shots, it’s great to have a variety of table props enhancing the photo, however, you have to be careful you don’t detract attention from the food and drink that you’re trying to promote. Depending on your Instagram theme, you might create compositions that are particularly colourful, or contrastingly only use items of a similar colour that complement one another. Decorative items that make the content more eye-catching, without taking the limelight are ideal. Aldi’s ‘never ending table’ Instagram account is a great example of food photography composition. Put your photography head on and think about angles and leading lines that draw the eye to your dishes, whilst still looking beautiful! Check out even more tips from some digital photography pros to master your restaurant marketing game. That wraps up our restaurant marketing tips for Instagram! Have any other strategies that work wonders? Let us know in the comments or on Twitter. Hopper HQ is a visual planning and scheduling tool for Instagram, bringing the creativity back to social media management and freeing up time to focus on the areas of marketing you love most 💙 Try it free today with our 14 day trial.